You have spent hours searching the shelves at your local DIY store for the perfect pieces to complete your kitchen or bathroom renovation, but all you have found is a bunch of ideas that just don’t fit together properly. What you need is a trained eye that combines your ideas with practical construction and beautiful artistry. Fortunately, Castle Remodeling specializes in breathtaking, one-of-a-kind renovations that will truly capture your heart. We offer a full range of bathroom and kitchen design services that include everything from custom cabinetry and stonework to clever lighting and flooring. Whether you want a modern kitchen design that incorporates all of the latest trends or a relaxing bathroom retreat to help you recoup after a long day, you can trust our talented designers to bring your dream space to life in a way you never thought possible. Why settle for off-the-shelf solutions when you can design your own kitchen with the expert assistance of Castle Remodeling? Simply bring your kitchen ideas to our design center and our outstanding team will get straight to work. With over 30 years of experience, our team knows how to blend styles, colors, and materials to stay ahead of the trends, creating beautiful designs that can withstand the test of time. From unique cabinets with crown molding to modern accents to elegant finishing touches, we will turn your outdated kitchen into a warm and welcoming space for entertaining your friends and family. 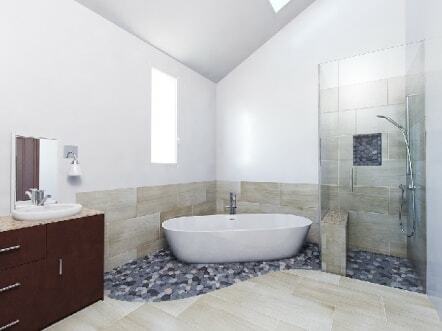 Whether you know exactly how you want your bathroom to look or you need a little assistance with the design process, the outstanding team at Castle Remodeling is happy to help! We are experts at maximizing efficiency and increasing aesthetic beauty, so bring us your bathroom ideas and we will provide you with exceptional bathroom designs that meet your style and budget. From whirlpool bathtubs and walk-in showers to custom vanities and tile work, we’ll turn your bathroom into the relaxing oasis you’ve always dreamed about. Utilizing decades of experience, the trusted and highly trained contractors at Castle Remodeling always do the job right the first time, allowing for complete bathroom or kitchen remodeling in as little as two to three weeks! One of our owners or a member of our professional team is always on hand to keep you updated on the status of your project, and we always run any last minute changes by you before any work is done. We keep our prices competitive, and our customer service is second to none. You are just weeks away from a brand new kitchen or bathroom with us! For expert advice on your kitchen or bathroom design, call (818)-991-0361!